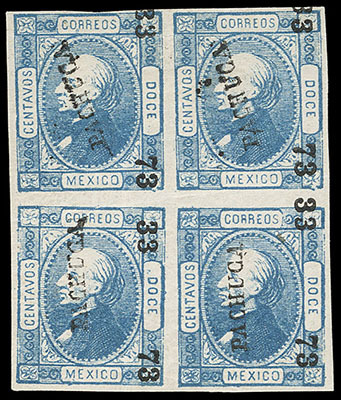 Mexico, 1872, Hidalgo imperf, 12c blue, "LA + F" watermark, Pachuca, Papel Sellado watermark, cons 33-73, top stamps in block of 4 with normal, full o.g., full margins, some faint creasing, Very Fine, a very scarce se-tenant multiple; with 1980 M.E.P.S.I. certificate. Scott No. 82b, 94 $900 for wmked singles. 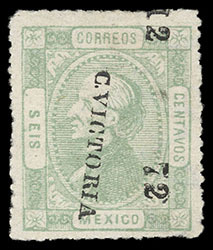 Mexico, 1872, Hidalgo perforated, 6c green, Victoria, Papel Sellado watermark, cons 12-72, without gum, wide margins and bright color, Very Fine and choice, a lovely example of this rare watermark variety. 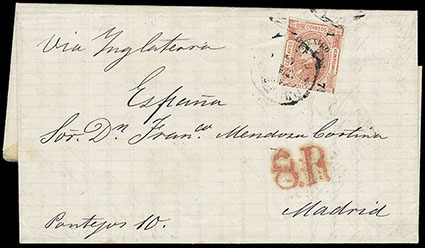 Mexico, 1872, Hidalgo imperf, 25c red, Mexico, unwatermarked, cons 1-72, tied by Mexico cds on folded letter to Madrid, Spain, endorsed "via Ingleterra" with bold red "8R" due stamp applied upon arrival, reverse with light red receiving cds, Very Fine, a very scarce destination. Scott No. 95 Estimate $250 - 350. 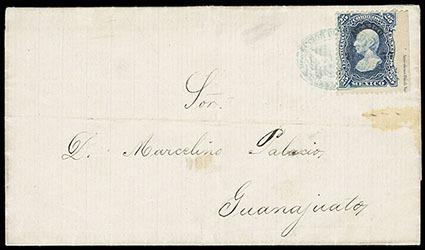 Mexico, 1874, Hidalgo Profile, 25c blue, Mexico, cons 1-77, showing part captured imprint in right margin, tied by blue Diligencia Generales oval cancel (Schatzkes 830) on 1877 folded letter to Guanajuato, Very Fine; signed J.K. Bash. Scott No. 109 Estimate $200 - 300. 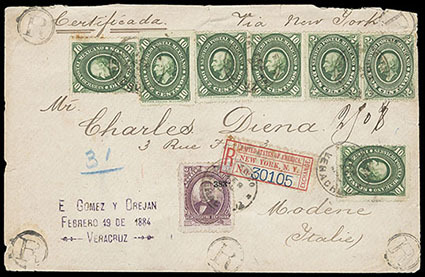 Mexico, 1882, Foreign Mail 2nd Issue (Juarez), 24c violet, con 383, in combination with 1884, Hidalgo Medallion, 2c green, two singles + 10c green, five singles on 1884 registered cover to Modena, Italy, all tied by Veracruz cds's with matching "R" in circle handstamps at edges, N.Y. transit backstamp and registry etiquette on front; light cover edge wear, Very Fine, a rare registered usage and mixed issue franking bearing the Juarez issue. Scott No. 138 Estimate $400 - 600.